My daughter Aimee ran her first marathon with me in May along the fabled Avenue of the Giants in Humboldt County. As we sipped champagne after the race, I reminded her that there are 3 really good reasons to grind your gristle to a painful pulp for 26 miles. First, naturally, you get the cool T shirt and the medal. Second, you acquire this sense of invincible confidence that lasts for maybe 60 years, not something to casually deprecate, plus you can eat anything you want. Most important, however, you get to keep the buffed legs and take them to the mountains. 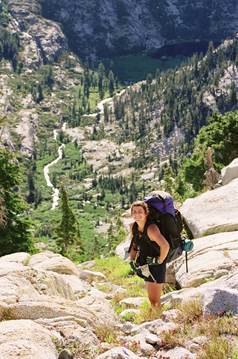 We took ours to the Trinity Alps in early July. We carried five days of wine plus a larder replete with onions, capers, fresh basil, and garlic—no freeze dried glop. (Check out the recipes on our website.) We drank freshly melted snow gleaming over glaciated granite and fondled clutches of lavender penstemon in the fractured talus. We admired the boldest of spruces and the oldest of boulders, tracked golden arrows and darting rainbows, shed a little blood but wasted no tears. One rugged cross-country day delivered us to Boulder Creek Lake, a sapphire mirror scraped from a high hardrock shelf with panoramic view of all the jagged peaks of the Trinities. This day nearly drained the last drop of our energy, but fortunately we still had a flask of our 1999 Primitivo. After the obligatory icy plunge, we noticed three healthy, wholesome young people slogging along the shore wearing neoprene booties and carrying clipboards. (That’s unusual.) I asked what they were doing, and to my immense delight, they responded: “We’re doing a Salamander survey for the Forest Service.” I suggested that perhaps they would like to join us for dinner to discover a Salamandre that wouldn’t be found in any ecology text. Salamandre vinus primitivicus is rarely seen outside Santa Cruz County, but known to appear on special evenings in the Trinity Alps. That night, I settled happily into the glow of a full tummy, young red wine, weary old muscles, and a sappy paternal pride. I awakened groveling in a trash can alley strewn with rotting garbage in a New York summer heatwave. (Winemakers have sensitive noses, you know.) My gummy eyes made rainbows in the moonlight. I heard the scuffing of gravel. Then I saw the source of the odor. Mr. Black. Right between Aimee and me. This wasn’t a time for whiny middle aged introspection. I jumped up and channeled my best slavering rabid Afghan wolfhound assault bark. The pine needles curled, the waterfall froze, and the rocks cracked. My dog was embarrassed. Mr. Black cocked his ear, shrugged, then rambled away over the silvery slabs. You won’t have to lose anything! Come join us for our Holiday Open Houses.